Cultivating daikon in the garden is a great way to enjoy something a little different. Planting daikon radishes isn’t difficult and once you learn how to grow daikon radish plants, you’ll be able to enjoy them year round in warm climates or replant them each year in cooler regions. A daikon is a Chinese radish (Raphanus sativus longipinnatus), also known as lobok and oriental radish. Daikon has large roots, and some of the biggest varieties can weigh up to 50 pounds. The most common types weigh from 1 to 2 pounds at maturity and can have up to a 2-foot leaf spread. Most people cook daikon radishes, but they can also be used in salads. Growing daikon radishes is a nutritious and enjoyable pursuit. These tasty radishes are low in calories and full of essential vitamins and nutrients. Daikon radishes are even grown year round in most parts of California and similar regions. Cultivating daikon radishes is similar to growing traditional radish varieties only they generally need more space and more time to mature. Radishes require full sun to part shade and regular water in order to thrive. Install drip irrigation for best results and put a 1-inch layer of mulch around plants to conserve moisture. 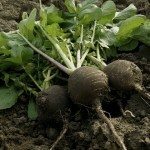 In spring, you can plant these radishes as soon as you can work the soil. Continual planting every 10 to 14 days will ensure successive crops. As with other radishes, growing daikon radishes are good to plant in places where you will put warm season crops such as peppers, tomatoes or squash. 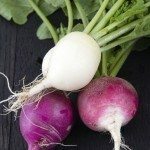 If you want mature radishes in the spring, you can also plant them in the winter with the use of a cold frame or some other means of protection, unless you live in a temperate climate. Place the seeds ¾ inch deep and 6 inches apart. Leave 3 feet between rows to allow for mature spread. 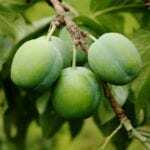 The plants will mature within 60 to 70 days. Now that you know more about how to grow daikon radish plants in the garden, why not give them a try and enjoy these tasty crops.